a short visual novel i made in a week, using ren'py. 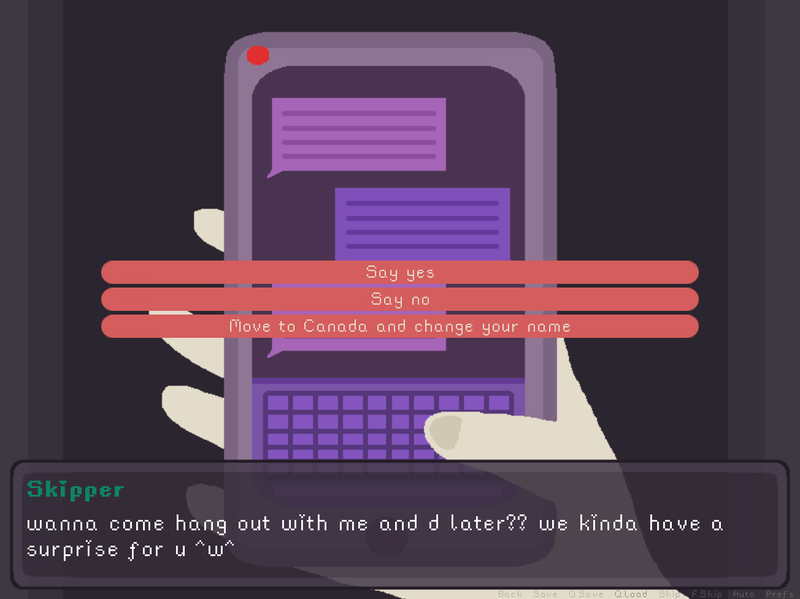 this is the first visual novel i've made, and the first game i've made on my own. i made it for a small game jam with some friends, with a theme of "fear of the unknown". 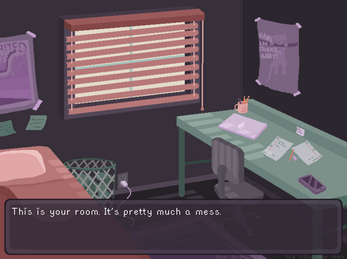 Stuck @ Home is a game about feelings, but mostly memes. o m g love this! reminds me a lot of being in high school n not just because of my secret homestuck obsession in the tenth grade. can't believe you made this in a week bruh, i made a game once and its literally so bad its only redeeming factor is . nothing. but this is great!!!!!!!!!!!! I really loved this game, during my first playthrough, which didn't record properly, I really wanted to cry at some parts. I love this game, the pop culture references,the art and also the realism. never has a game touched me so much I wanted to cry. this game was lovely. i love games where i can relate to the main character. it has made me want to go watch a sunset with my friends. Hey there! I played your game on my channel and liked it! I gotta say though, the good ending seems a bit too easy to get honestly. Nonetheless, it's a good game. And i'm sorry if i didn't bother getting the other endings. I didn't even play it yet, but I can already say that I love it! aw, im glad this resonated with you so much! :^) thank you! I made a let's play for my channel as well. I only went through one ending, but I hope it helps! I think it's very beautifully illustrated and the game play is well done. Personally, I think the game was sweet but could have been a really good chance to touch on difficult topics like post-graduation depression, Post Commencement Stress Disorder and Anxiety. I think it tried to touch on them in an informing way, but I don't think it was done well. I would suggest for games like this, which start discussing mental health, getting an advisor that you may know. If you are close with any psychiatrists or psychologists, it couldn't hurt to ask for advice. sorry, I can't launtch it. But I like the illustrations pretty much. This was awesome! Great jokes, though I unfortunately didn't get the Homestuck reference. Damn! This was great to play, loved it! Amazing game and props to the developer! This really sends you to Feeladelphia and felt I could really relate myself to the main character. Here is a video I did with a short review. Looking forward to your next game! Are you stuck at home too? Watch this video! This game was really fun and interesting to play. I really like the art style and concept of the game. I hope I got the story right and showed the most of the game. So, yes. This game is brilliant and really speaks to me. Really, really, really, really great game. Actually, one of the best novels i've ever played. Anyways, the game is incredible, the art is incredible, so was the ost. Love it. Oh, you're so sweetie! Thanks for the reply! Guys I cant open the game and I cannot find the instructions.... Can anyone help me? after downloading the zip file, you'll need to unzip it and run the .exe file! Game was very well made! HELLA props to you. My video doesnt do this rad game justice but here it is! Loved ur game bruh. I fell in love with your game, dev. It was funny, yet serious all at once. You really took the relationship between friends and laid it bare. Thank you, for such a great game! I'm glad I got the good end, though I may go back to see if there's anything else. Played your game. Really enjoyed it. Hello, is there any chance that you could release this game for mac? i think it should work on mac as is!